Obituary – Marshall, Edgar William « Perry High School Alumni Association, Inc. Final services for Edgar W. Marshall, 40, son of Mrs. Fannie Marshall, 120 Cedar street, who died suddenly Tuesday afternoon at his home in Oklahoma City will be held Friday at 2 p. m. in the Newton Funeral Home chapel. Marshall, an employee of the Oklahoma state highway department testing laboratory, was stricken shortly after going to his office Tuesday morning and returned home at noon. He died at 3 p. m.
The deceased is a veteran of the last World war, having served in the Pacific for three years with a naval construction battalion. 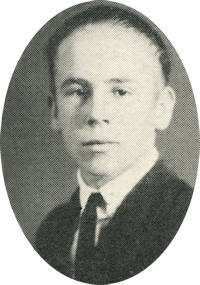 He was born April 18, 1907, in Perry, and graduated in 1926 from the local high school. In 1932 he married the former Mabel Lesh of this county. They have two children, Arman and Donna Gayle. Following discharge from service, Marshall moved to Oklahoma City from Perry and had been employed by the highway department since that time. In addition to his wife, mother, and two children, survivors are brothers and sisters, Mrs. Worth Roberts, Bud Marshall, and Mrs. 0. R. Johnson of Perry; Otto Marshall of Floydada, Texas; Leo of New Orleans; Mrs. Paul Davis and Austin C. Marshall of Oklahoma City.